The first Caledonian MacBrayne ferry route to go out to tender has failed to attract any bids, the Scottish Executive has confirmed. Ministers are opening up all of CalMac's routes to private competition to satisfy European Union rules. CalMac said it currently needs a £2.5m annual subsidy to provide this service. Competitor Western Ferries said prohibitive costs and inflexible service specifications would make a commercial operation impossible. Western Ferries runs a commercial service on a parallel route between Gourock and Dunoon. It has attacked ministers' handling of the tender, saying they must have been aware of the financial realities before the process started. The route was offered as a commercial service with no subsidy and the removal of the current operating and timetable restrictions. The Scottish Conservatives said the affair showed the "total inability" of ministers to run a ferry tendering process. Tory transport spokesman David Davidson cited the history of a tendering operation for a ferry route in the Northern Isles, followed by some firms withdrawing from a ferry tendering exercise for west coast routes. "Now we have the farcical situation of the two remaining operators short-listed for Gourock to Dunoon dropping out, meaning this entire exercise has run out of steam," said Mr Davidson. "The time has undoubtedly come for the Auditor General to step in and instigate a comprehensive review of the executive's conduct in the tendering of all ferry routes as the current shambles clearly doesn't help anybody - least of all the taxpayer and users of these vital routes." 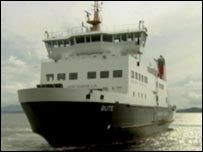 Solidarity MSP Tommy Sheridan said the executive had bungled an attempt to "privatise" ferry services. "I am not sorry the bid has failed - my question is why did the executive feel the need to tender in the first place," said the Glasgow list MSP.